Links to Useful Sites on Gardening, Allotments, Cooking, etc. With the best will in the world, no single web site can cover everything so we've linked to other web sites that we think you'll find interesting and useful. Help and advice for the allotment gardener. 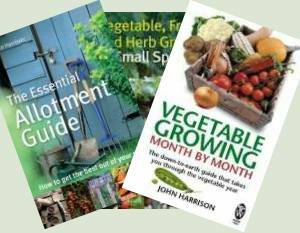 Growing your own vegetables, fruit or herbs or just seeing what others suggest you do. Allotment associations are often joined with local gardening associations. They provide help and advice to the members of the association. Gardening and growing things is both educational and healthy for children. Better to see kids outdoors than watching TV. Take your kids down to the allotment and watch them grow! The government has been promoting allotment growing and regeneration. These sites will give you an insight into official thinking about allotments and the national gardening and allotment sites. Garden design can be a very specialist subject and landscaping can be very daunting for the beginner. All part of the garden designer's skills. Online shopping means you can buy everything from a trowel or spade to specialist and unusual tools from the comfort of your own home. The range of garden equipment is huge but don't forget a spade! Pests such as rats and mice, moles and pigeons not to mention the slugs and snails all cause the gardener problems. Growing in the garden you will often be buying plants and getting these online means you have much more choice from your garden plant supplier. Do check out delivery costs though. One of the most useful machines for the allotment or produce gardener is a rotovator and the Merry Tiller is almost legendary. From rotavators to greenhouses you can buy anything online now. Online shopping is especially useful for specialist items that you used to get mail order. A listing of the best polytunnel and greenhouse suppliers in the UK. Self sufficiency and smallholding is enjoying a resurgence in the UK and Europe as people look for the good life. Seed Suppliers, Masses of choice and not enough room to grow them all! Many seed merchants now offer online shopping or at least will send a catalogue to you. A list of sites that may be useful for allotment holders and gardener that don't fit in to the other sections - in other words the sundry links.